There are certain culinary classics that have stood the test of time secure in a city that appreciates fine food. San Francisco is one such city and the legendary food they cherish is their very own and very unique sourdough bread. This flavorful bread began in 1849 (the same 'golden' year the 49ers Football Team is named after) when Isidore Boudin, a hopeful immigrant arrived in San Francisco from Burgundy. He was drawn to California from his native France by the recent discovery of massive deposits of gold in the region's streams and mountains. But Boudin had no desire to dig in the dirt. As a skilled baker, he intended to make his fortune baking bread for the hungry miners, yet he started with little beyond but his own knowledge of classic French baking techniques and a precious bag of flour. Very quickly he noticed a unique tangy taste had developing in his bread. As a professional, he was able to dentify its source and knew that he had found his treasure - a natural occurring yeast. And not just an common yeast, but one unique to San Francisco. Scientists would later honor its rarity by naming this terrior bacterium "Lactobacillius Sanfrancisensis". Once incorporated within flour, it naturally causes the dough to raise. By always preserving a small starter portion of the dough, the bacterium will continually act as a levying ageny for future loaves. Boudin worked hard and soon his horse-drawn delivery wagons were delivering his signature loaves to elite Nob Hill homes and elegant downtown hotels. Sadly his long days (and perhaps one or two too many pastries) caught up with him and he died in 1887. But he had not labored alone. His wife, Louise, and his beloved daughter, Lucie, knew the bakery as well as he and on his death continued producing the bread he loved. Year by year the bakery's client list (and its bank account) grew. Then in 1906, disaster struck as a massive earthquake shattered San Francisco's calm. And although the earthquake was very bad, the resulting fire was worst. Soon huge sections of the City were on fire - including area where the Boudin Bakery was located. Louise had lost her husband; she had no intension of loosing her bakery as well. Dodging falling bricks and flaming timbers she worked her way to the remains of her baking kitchen and found the original dough starter begun by her husband. She scooped it into a bucket and carried it out to safety. Referred to thereafter as the "mother dough", it continued to raise dough (pardon the pun there) for the Boudin family at their rebuilt bakery from 1910 to the late 1930's. Yet by the end of the 1930's the Great Depression had taken its toll. San Francisco's grand families no longer entertained lavishly and many of the major hotels had closed their namesake restaurants. Even the demand for a truly great bread had dropped dramatically as families and corporates watched every penny. Enter Steve Giraudo, Boudin's Master Baker. An Italian by birth, he was as devoted to fine bread as Louise and Isidore Boudin had been. He bought both the bakery and the mother dough starter. Once again San Francisco had her beloved bread (and so did the many sailors and soliders passing through San Francisco during World War II). 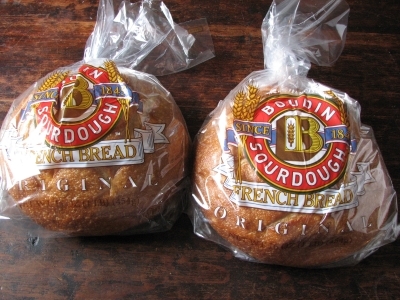 This increased exposure broadened the fame of Boudin Sourdough French Bread so that in 1975, Steven's son, Lou Giraudo, opened their first public demonstration bakery and cafe on Fisherman's Wharf to the delight of thousands of visiting tourists. Today there are eight additional cafe locations in the San Francisco area and seven more throughout the State. Not bad for a firm that was started by a Frenchman with a bag of flour. So you can see why the 49ers Football Team should (and do) love this bread. Like them, it has survived hard times and 'risen' to the acclaim of all. And now they are on their way to New Orleans, a city with such a strong French heritage Boudin himself would have loved it. Maybe the fact that New Orleans's Super Dome looks a bit like a rounded load of sourdough bread will bring them great good luck! Posted on January 31, 2013 by Ana Kinkaid and filed under Baking, Bread, Cooking, Creativity, Cuisine, Culinary History, Disasters, Elegance, Food, French Cuisine, Hotels, Professionalism, Restaurants, Sommeliers, Technique, Terroir and tagged 1906 San Francisco Earthquake Boudin Sourdough Bread California Gold Rush Fisherman's Wharf French Baking Great Depression Isidore Boudin Lactobacillius Sanfrancisensis Mother Dough Starter Nob Hill San Francisco 49ers Football Team World War II.